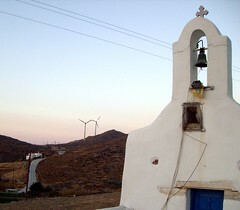 The cyclades are not only littered with churches, they have more than their fair share of windmills. We experienced the impressively powerful winds during our sailing motoring trip, gale force for most of the vacation. Tucked-in behind the obligatory church bell tower modern windmills were clearly harnessing the power in Santorini. Older mills were converted into Tavernas, modern residences, and some left without their sails. This scribble was published on Thursday, September 4th, 2008. You can follow any banter on this scribble with the RSS 2.0 feed. You can share your inspired musings after typing the anti spam word near the bottom of the page. But no Pinging because its too naughty.